It may be hard to detect the difference between seborrheic keratosis and melanoma , a potentially fatal skin cancer. It is important to see visit the doctor anytime new or changing skin lesions are noticed. Your doctor will ask about your symptoms and medical history. A physical exam will be done. Your doctor can usually make a diagnosis upon examination of the skin growth. 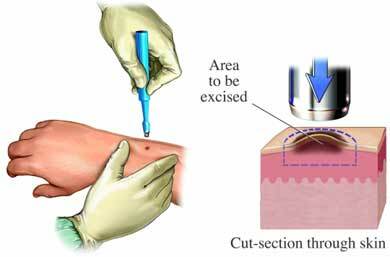 You may need further testing, such as a skin biopsy , to rule out other skin conditions. Seborrheic keratosis. American Academy of Dermatology website. Available at: http://www.aad.org/dermatology-a-to-z/diseases-and-treatments/q---t/seborrheic-keratoses. Accessed September 1, 2017. Seborrheic keratosis. American Osteopathic College of Dermatology website. Available at: http://www.aocd.org/?page=SeborrheicKeratoses. Accessed September 1, 2017.